Numismatics, or the study and collection of coins, currency, and medals, make up one part of our collections here at the Luther College Anthropology Lab. One of our student workers is conducting a full inventory of the collection and picked a couple of her favorites, while another chose an ancient Greek coin recently transferred from the anthropology collections to the Classics department. This token was designed for the 1896 presidential election between William McKinley and William Jennings Bryan. Produced by the McKinley campaign, it focuses on the biggest policy issue of the day: whether or not cheaper silver should be implemented to back U.S. currency rather than the gold standard. Bryan, a “Silverite,” endorsed the idea of silver coinage, but McKinley argued that the resulting inflation would further harm the economy of the country already in a severe depression. McKinley won the presidential election of 1896, in part due to his effective campaign to defeat the free silver proposal. 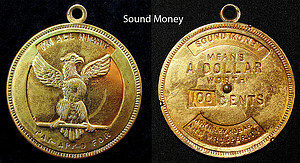 1896 Presidential Campaign Token (N433), "Sound Money"
1896 Presidential Campaign Token (N433), "Free Silver"
My project for the Anthropology Lab is to complete a full inventory of the Numismatic Collection. Part of this collection includes campaign tokens and most are rather simple with some “vote for me” logo. This particular piece in the group of U.S. medals and campaign tokens caught my eye first because it is a brilliant gold color, and second because it features a movable part. The invention of coinage allowed for easier trade by fixing values through weight, and was later marked by different stamped images like turtles, lions, and bulls. Ancient Greece’s coins were issued by the separate city-states and can be identified by the different images depicted on them. These images would relate to the city’s history, mythology, and characteristic products. Corinth depicted Pegasus on many of its coins due to the myth of its ancient king Bellerophon taming Pegasus with the help of a golden bridle given to him by Athena. 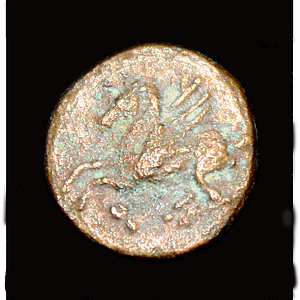 This coin is recognizable as Corinthian by the letter Koppa beneath the front legs of Pegasus. The Koppa is a symbol for Corinth which had the spelling Ϙόρινθος. My interest in the Luther’s ancient coin collection began while working on my senior project which focuses on the iconography of doves in Roman coins; it has however spread to a wider range of cultures and time periods. This object is a bank note from France in the late 1700s called a Territorial Mandate. The creation of this note was meant to stimulate the troubled French economy and was designed to be a challenge to counterfeit. However, the bill did not last a full year before it was removed from circulation. The bill proved very easy to forge and very few people wanted to use it while the old bills were still in circulation. In the course of a week this bill was worth 1/10th of its original value, causing it to become widely unpopular and removed from circulation rapidly. I chose this bill because of the fascinating story surrounding it. It absolutely blew my mind that this bill could lose value so quickly while other forms of currency continued to do well in the country. I also was intrigued by the fact that a bill worthless in the past could be priceless now because of its failure.